Make your Valentines Day festive with this ridiculously delicious Coconut Strawberry Puppy Chow. White chocolate, freeze dried strawberries & coconut are such a sweet combination. Guys. Guuuuys. This Coconut Strawberry Puppy Chow will give you life and win you friends. It’s that good. So puppy chow is typically chex cereal tossed in melted chocolate chips and peanut butter then coated in powdered sugar. Has everyone experienced this glorious snack? Some refer to it as muddy buddies. That’s the incorrect name for it but whatever, we can still be friends. I’m a Midwesterner through and through and it’s solidly called puppy chow here. This little spin off features white chocolate, coconut, freeze dried strawberries that get pulverized into a powder, powdered sugar and fun festive Valentines sprinkles. Because could there be a cuter snack for Valentines Day? The pink is so perfect and I love that it’s completely natural. The strawberry flavor in this puppy chow is kind of unreal. I love using the freeze dried strawberries you can find with the dried fruit for things like cake, frosting and this strawberry puppy chow. They add so much fresh strawberry flavor without the issue of the liquid of pureed strawberries. The tartness of the freeze dried strawberries is so perfect with the sweet white chocolate and powdered sugar. It helps even things out, keeping it from getting too sweet. If you happen to be making this and realize you are out of powdered sugar like I was when testing the recipe, you can make your own powdered sugar by whizzing up regular, granulated sugar and cornstarch in the food processor. 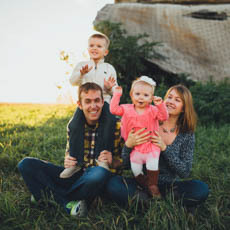 You can find that super simple DIY here. It’s saved me more than once. The coconut adds some great texture and flavor to the puppy chow too. The combination of sweet, slightly tart strawberries and tropical coconut is kind of magical. I’m thinking you could package this up in cute little cellophane bags for your kids to hand out at school (if they allow homemade treats) or to give to friends and neighbors. It would also be a fun after school snack to surprise your kids. 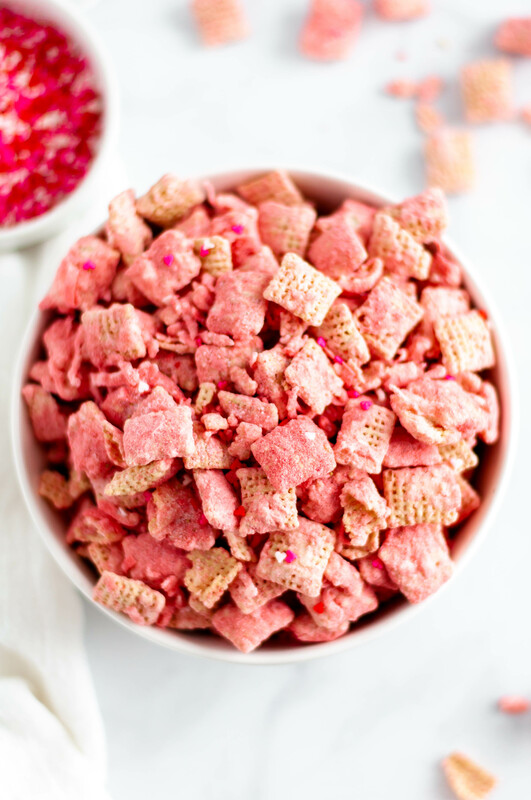 Make your Valentines Day festive with this Coconut Strawberry Puppy Chow. White chocolate, freeze dried strawberries and coconut are such a sweet combination in this crunchy, addictive treat. In a large bowl, mix together the chex cereal and coconut. Set aside. Add freeze dried strawberries to a blender or food processor and pulverize into a powder. Mix with the powdered sugar and set aside. Add white chocolate chips to a microwave safe bowl. Melt in 30 second increments, stirring each time, until just melted. Pour melted white chocolate over the cereal and stir until completely coated. Add half the powdered sugar mixture and sprinkles and stir to coat. Add remaining sugar and stir until completely coated. Store in an airtight container.